Shad darts are among the simplest and oldest freshwater fishing lure designs. These small jigs are used to catch a variety of freshwater species. These jigs are available from 1/32 oz. up to 1/4 oz. or more, with 1/ 16th oz. jigs being the most popular. Shad darts may be have a bare lead finish, be painted or feature a plated finish. For fishing live minnows and other baits, some anglers prefer a simple dart type jig, with no coloring or hair. A step up from the unpainted version is the classic painted shad dart with a deer hair dressing. Painted shad darts are almost always painted two contrasting colors, without eyes. The tip is painted or coated on a slant which matches the angled design of the jig head. This pattern is usually done by dipping the head in the finish, which is a fast, efficient method for tackle manufacturers. 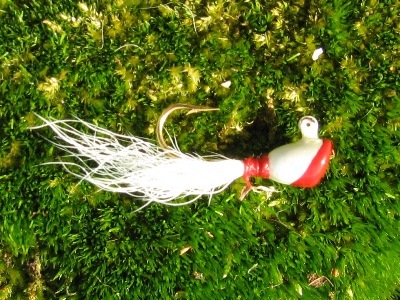 Popular jig patterns usually include a white or chartreuse base coat tipped with red, orange, green or other contrasting color. Another oldschool shad dart design is covered with a gold or silver metallic finish. These darts are designed to reflect flashes under water, which are thought to attract shad and river herring. Gold or tin coated jigs may or may not have bucktail dressings. This family of jigs have a variety of uses in freshwater fishing. Originally intended for catching American (white) shad, hickory shad and herring, these simple but effective jigs have gain a reputation as an essential lure for freshwater fishing. They can be casted and worked along the bottom like any jig. They are also used for jigging in a wide range of situations. Another very popular application for these micro jigs is for fishing live minnows. Shad darts are especially popular as a live bait hook when fishing for species such as crappie, yellow perch, and other species. Their size should be matched to the species of fish targeted. When fishing live baits, the bobber or float must also be matched to jig size.